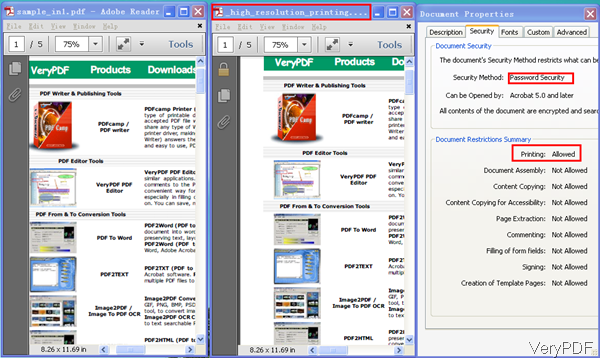 When you need a tool for encrypting PDF by command line, this article may be helpful for you. VeryPDF PDF Toolbox Command Line can be used to encrypt PDF from two levers 40bit and 128-bit by two kinds: user password and owner password. If you need to know use this software together with applications like VB, VC, C#, .net and there is also corresponding version for you. In the following part, I will show you how to use this software. This is command line version software, once downloading finishes, there will be an zip file. Please extract it to some folder then you can find the executable file in sub folder bin. And there are many examples saved in bat files in sub test folder. And the help document is saved in sub doc folder. When you need to encrypt PDF file, please refer to the following command line template. By above command line, you can set ownerpassword as 123 by 128bit level and only permit printing option. -permit <permissions> : permissions are applied to the output PDF only if encryption strength is specified or an owner or user password is given. Please check software working effect from the following snapshot. By this software you can also remove password. When you remove owner password, this software can make it directly. When you need to remove open password, you have to know the password. Please check one more examples here. -inputpassword : when you need to remove owner password, please add this parameter then input password. This software can do more than what I have stated here. If you need to know more, please pay attention to our knowledge base. During the using, if you have any question, please contact us as soon as possible. This entry was posted in PDF Toolbox Command Line and tagged encrypt PDF. Bookmark the permalink.